Revenue in the Luxury Leather Goods segment amounts to US$17,218m in 2019. The market is expected to grow annually by 2.8% (CAGR 2019-2023). In global comparison, most revenue is generated in United States (US$11,354m in 2019). In relation to total population figures, per person revenues of US$22.76 are generated in 2019. Luxury Leather Goods cover handbags, suitcases and briefcases as well as small leather goods such as wallets. The market definition corresponds broadly to the segment Luggage and Bags of the Consumer Market Outlook’s Accessories section. The only difference is that Luxury Leather Goods only cover the luxury range. The shown market data are based on an analysis of more than 100 of the biggest luxury companies in the world. A complete list of all companies and brands covered can be found in the methodology description. Accordingly, leather goods from smaller companies or artisanal production unaffiliated with the companies covered are not included. All data are shown at retail value, which includes markups for retail distribution and sales taxes. The five most important players in this category are LVMH (with brands such as Louis Vuitton, Rimowa, Moynat and Loewe), Kering (Gucci, Saint Laurent, Bottega-Veneta and others), Coach, Michael Kors, Hermès and Tumi (which has been acquired by Samsonite but is still listed independently here). 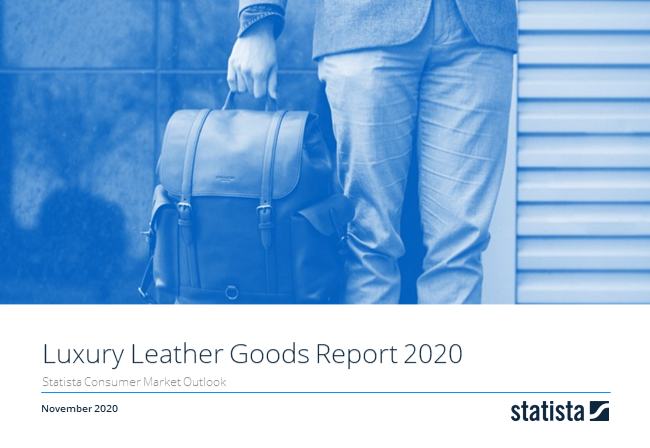 Leather Goods have proven to be one the fastest-growing segments within the market for personal luxury goods and are projected to grow at rates above market average up to 2022. Reading Support Revenue in the Luxury Leather Goods segment amounts to US$17,218m in 2019. Reading Support The Luxury Leather Goods segment is expected to show a revenue growth of 3.1% in 2020. The “Revenue” box shows the forecasted revenue development of the selected market (market segment, region) in million of the selected currency for each year. Reading Support The average revenue per person in the market for Luxury Leather Goods amounts to US$22.76 in 2019. The "Average Revenue per Capita" box shows the average market value of the selected market (market segment, region) per person in the selected currency for each year. Reading Support With a market volume of US$11,354m in 2019, most revenue is generated in United States. The following Key Market Indicators give an overview of the social and economic outlook of the selected region and provide additional insights into relevant market-specific developments. These indicators, together with data from statistical offices, trade associations and companies serve as the foundation for the Statista market models. Here you can find more studies and statistics about "Luxury Leather Goods".